Page compiled by: Bioversity International/ILRI, Addis Ababa, Ethiopia (Alexandra Jorge); ILRI, Addis Ababa, Ethiopia (Jean Hanson) including information extracted from: Reed BM, Engelmann F, Dulloo ME, Engels JMM. 2004. Technical guidelines for the management of field and in vitro germplasm collections. IPGRI Handbook for Genebanks No.7. IPGRI, Rome, Italy. In field genebanks the plant genetic resources are kept as live plants that undergo continuous growth and require continuous maintenance. They are often used when the germplasm is either difficult or impossible to conserve as seeds (i.e. when no seeds are formed, seeds are recalcitrant or seed production takes many years, as for many tree species) or the crop is reproduced vegetatively. Field genebanks provide an easy and ready access to the plant genetic resources, for characterization, evaluation or utilization, while the same material conserved in the form of seeds, in vitro or cryo must be germinated or regenerated and grown before it can be used. They are also useful for conserving vegetatively propagated genotypes that commonly produce variants (genetic variation) since these can be more easily identified and rouged out in the field than in vitro. Field genebanks however, are generally more expensive to maintain, requiring more labour, more inputs and more space (land) than other methods of conservation. They also have higher levels of risk from natural disasters and adverse environmental conditions like drought, floods or attacks from pests and diseases. Maintaining plants in field genebanks is costly and risky and this method of conservation is usually used when there are no available alternatives or the storage period of other alternatives is very short and not practical. Field genebanks are mostly used for the conservation of clonal crops, often complementary to other conservation methods such as in vitro and cryo banks. Field genebanks are particularly sensitive to germplasm health issues and regular monitoring and testing together with application of disease control measures is essential to maintain plants free of diseases. Although field genebanks may not be the most secure method of germplasm conservation, often they are the only practical and cost effective way to conserve germplasm of clonal crops, especially when resources and skills are limiting. When field genebank conservation is the only viable alternative, careful planning and field management can help to mitigate the risks. Duplicate field genebanks in more than one site or in an in vitro genebank as a safety backup. Accessions available at other genebanks may require fewer duplicates than unique samples. Select a site with environment and soil type best suited for the species to reduce the risk of poor adaptation. Select a secure site with the best possible physical safety for theft and avoid areas with natural threats such as volcanoes and hurricanes if possible. Select a site some distance from fields of the same crop to reduce threats from pests and diseases. Select the field based on appropriate rotation and infection history to avoid mixtures and infection/infestation with different pests. Select a site with adequate rainfall or water supply for supplementary irrigation to avoid drought stress. For those reproduced vegetatively, one plant is sufficient to maintain the genetic variation but more plants are needed for security and it is recommended that a minimum of five plants are maintained for each accession. For tree species that are slow growing and maintained in the genebank until, eventual seed production, more plants are needed to capture the variation at the time of eventual seed production. Up to 100 plants per accession is preferred with a minimum of 25 plants. Use adequate spacing and plant density in the plot to avoid competition that will result in weak plants or allow rapid spread of disease or insect pests. Avoid selecting only strong plants to retain in the field genebank, as that would reduce genetic variation. Select the planting material carefully so that only healthy material and vigorous parts of the plant are used when planting new fields or replanting empty plots. When material is transferred from other sites or countries, follow the specific regulations for the safe transfer of germplasm for that crop. Correct and clearly written labels are extremely important in germplasm collections. Field labels should be in indelible ink and as indestructible as possible; field maps are essential as a backup to labels that are easily lost or destroyed. When new plots are established, allow an overlap of a few months before destroying the older field to ensure the plants establish well in the new field. Keep the plots well weeded to avoid competition. Eliminate plants growing off-row. Rogue plants that are genuine mixtures. 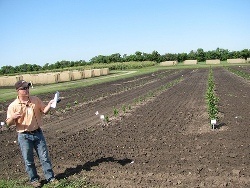 Irrigate the field after establishment of the plants and when subsequently needed. Do not allow the leaves to wilt at any stage. Apply fertilizer at the recommended rate for the crop in that area. Inspect the field regularly and preferably daily to ensure that the plants and plots are in good condition and take action quickly if any problems are noted. Coordinate periodic field inspections with pathologists and virologists during the growing season. Spray with appropriate chemicals when necessary. Spray with fungicide to control mildew during the rainy season or when using irrigation and with insecticide at the first sign of insect damage. Rogue out any infested material to eliminate all parasites before harvesting any plant material and burn the residues. Distinctive traits are specific for each species. For accessions compare traits with previous passport or morphological data. Digital images are useful for identification and comparison. Herbarium specimens are important to compare specimens to verify accession identity. For more detailed information about when to store material in a field genebank see Reed et al., 2004. Engels JMM, Visser L, editors. 2003. A guide to effective management of germplasm collections. IPGRI Handbooks for Genebanks No. 6. IPGRI, Rome, Italy. Available in English (1.4 MB) and Spanish (1.5 MB). FAO. 2013. Genebank standards for plant genetic resources for food and agriculture. Food and Agriculture Organization of the United Nations, Rome. Available in English, Spanish, French, Arabic, Russian and Chinese here. Reed BM, Engelmann F, Dulloo ME, Engels JMM. 2004. Technical guidelines for the management of field and in vitro germplasm collections. IPGRI Handbook for Genebanks No.7. IPGRI, Rome, Italy. Available here. Saad MS, Ramanatha Rao V, editors. 2001 Establishment and management of field genebank, a Training Manual. IPGRI-APO, Serdang. Available here.